The staff of the Bedford Pets Unlimited have always taken excellent care of their birds and, Baby was no exception – which is how we met, as she needed those beak trims so often. For whatever reason, Baby & I got on well, and she would dance (moving side to side so fast as to make you nauseous watching her!) the moment I entered the store for attention. 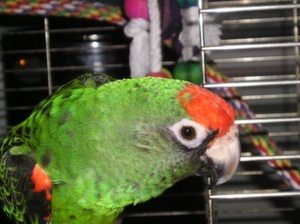 Anyone who enjoyed birds enjoyed Baby – and when the store was kind enough to sell her to me, many would visit her in the practice. A HUGE Thank you to Paige, Krista, and all other staff there for their support. Baby was an impressive ambassador for anyone interested in the care of birds, as she allowed many to pick her up and would talk in her own way to them. It is also because of Baby that I met an excellent mentor in Anna C. & for this, I will be always grateful. December 11, 2011 – Hunter arrived from an abusive situation, and really only wanted attention from me from the moment she arrived, after being abandoned at another Pets Unlimited Store. Hunter was a mess – no tail feathers, severely trimmed back wings, and she had likely pulled many of her chest feathers – she was so damaged that it was a challenge to figure out her exact subspecies. Whomever had her prior to our relationship had fed her many different junk foods as for the first months of being with us, Hunter would almost ‘attack’ anyone that had pizza, chips, french fries, or ‘Doritos’ – and she was not impressed when she wouldn’t get what she wanted. It was a challenge finding a balanced diet that she would accept, let alone eating healthy fruits and vegetables – but we both learned. Amazingly, she was potty trained from the previous care-givers, and she would perch on my shoulder for hours at a time with no accidents! After a few months, her feathers started to come in, and she turned into a beautiful ‘Greater Jardine’, and with her feathers came a better ability to balance herself. Like Baby Benny, she would travel back & forth to the practice with me – and either would be upset if they were not brought along. However, Hunter’s ‘claim to fame’ was that she could clearly talk – though we did not know it at the time. When she did speak, it was with the most eire whisper and, only when I was with her alone. It was so un nerving until I figured out where & what was going on – I just never expected it. After she become more comfortable, her talking was regular, she bobbed up and down to get my attention, went to work with me everyday in her carrier (as did Baby) and, never failed to make anyone smile. Every day, rain or shine, summer or winter (with fleece covers on their ‘Celltie’ carriers) they were in the practice adding to the enjoyment of everyone! I cannot say how often one of them made us smile during those times when things just were not great. Both these wonderful souls were beyond the care abilities of anyone we knew – and we tried to find them! Nothing is worse for any caregiver, owner, partner, or pet owner to know you have done the best for your friend, and there is nothing left to offer them. All we can do is commune with them even more so – thats all that can be done. I cannot understand how the loss of two creatures that barely would have weighed 450gm together, and lived in spaces less then 3-4 ft square would tear such immense holes in our hearts. Only those people who have the patience to care for exotic pets – reptiles, birds, fish – you name it, can begin to understand. To all of those clients (daresay friends) who have entrusted your pet (exotic or otherwise) to our care – Thank You. Please know that the team at Sunnyview Animal Care give their all to your pet, and to you. Please also know that when they pass – we have some intimate understanding of the loss you and your family are experiencing, we commiserate with all our clients. We are at 36 Duke Street, Bedford - same phone number (new web address!) & with our very enthusiastic staff ready to see your pets! Emergency Services via the Metro Animal Emergency Clinic open 24 hours. © 2019 | Sunnyview Animal Care.